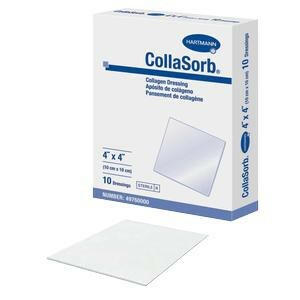 CollaSorb, manufactured by Hartmann-USA, is a wound dressing ideal for managing acute and chronic wounds. Wound care dressings have a variety of uses. Sterile wound dressings like CollaSorb are ideal for a primary dressing. This means that the sterile dressing can be in direct contact with the wound. Sterile wound care dressings decrease the risk of contamination to wounds. This decreased risk also helps to prevent infection. This dressing is composed of 90 percent pure collagen and 10 percent of calcium alginate. These ingredients work together to provide an exceptional amount of absorbency up to 30 times the weight of the dressing. This benefit along with it's sterility makes this product ideal for managing acute and chronic wounds with light to heavy drainage. Wounds that have heavy exudate can be cared for by this product with the addition of absorbent secondary dressings. This product provides a moist healing environment for wounds which can speed up the healing process. This benefit also helps with creating less frequent dressing changes and remains in direct contact with the wound bed when totally saturated. This product has an additional benefit of being easy to cut and apply making it perfect for doctors, hospitals and home care. BUY CollaSorb from Vitality Medical today. Can absorb 30 times it's weight. Provides moist wound healing environment that aids in less frequent dressing changes.